WELCOME TO LUXURY VILLA IN THE MUCH SOUGHT AFTER AREA OF EAGLE POINTE. DECORATED TO THE HIGHEST STANDARD, IT IS FULLY A/C, PLUS HAS CEILING FANS FOR ADDED COMFORT. 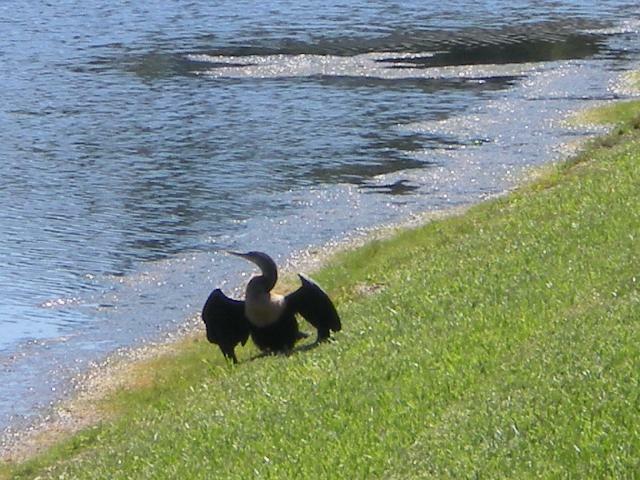 IT OVERLOOKS A LAKE AND CONSERVATION AREA, WHERE MUCH WILDLIFE CAN BE OBSERVED, SUCH AS HERON, EAGLE, STORK AND EGRET. FISHING IS ALSO ALLOWED IN THE LAKE. PRIVACY IS GUARANTEED, ALTHOUGH YOU’RE ONLY 10 MINS FROM DISNEY, SHOPPING MALLS, RESTAURANTS, GOLF COURSES AND NUMEROUS OTHER ATTRACTIONS. A REAL HOME FROM HOME WITH MANY EXTRA COMFORTS TO GIVE YOU THAT TREASURED DISNEY HOLIDAY OF A LIFETIME.THE POOL IS SOUTH-FACING WITH A FULLY FURNISHED SUNDECK.THE POOL AND PATIO ILLUMINATE AT NIGHT - IDEAL FOR DINING AND LATE NIGHT DRINKS! luxury living room – ideal to get away from it all. Family room – with patio doors leading to the pool. It has an entertainment centre with plasma cable tv, dvd, hi fi system, cd library and selection of board games and books. Spacious dining room – big enough for the whole family to gather for those special occasions. Breakfast/dining area - ideal for those snacks! Kitchen – fully equipped with every appliance- double sink with waste disposal, oven, dishwasher, microwave, huge fridge-freezer with water dispenser and ice-maker, kettle, toaster, coffee maker, blender, crockery, cutlery and all kitchen utensils. Laundry area – washer, dryer, iron and ironing board. Master bedroom – beautifully furnished with jungle theme with american kingsize bed, huge walk-in-wardrobe, dresser, cable plasma tv and dvd. Ensuite bathroom– decorated in a ‘roman' theme , with twin vanities, step up bath, separate shower, wc. Queensize double – comfortably furnished with built in wardrobes, dresser, cable tv and dvd. Twin 1 – cottage style furnishings with fitted wardrobe and dresser. Twin 2 – disney themed for younger guests. Built in wardrobes and dresser. Games area – located in garage with table-tennis, pool table, table football and darts. Family bathroom - huge walk-in shower, vanity and wc. There is a strict no pets policy and no smoking is allowed in the villa. Smoking is allowed outside on the patio area. My friendly management company is locally based and on call 24hrs if you need any help. 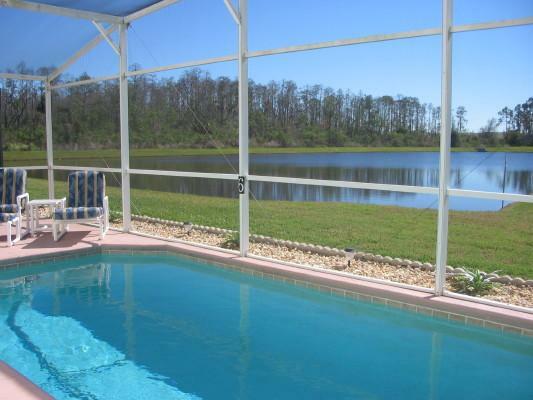 Private south-facing pool overlooking lake.